This was Day 1 of a trip that I'd been fairly apprehensive about. 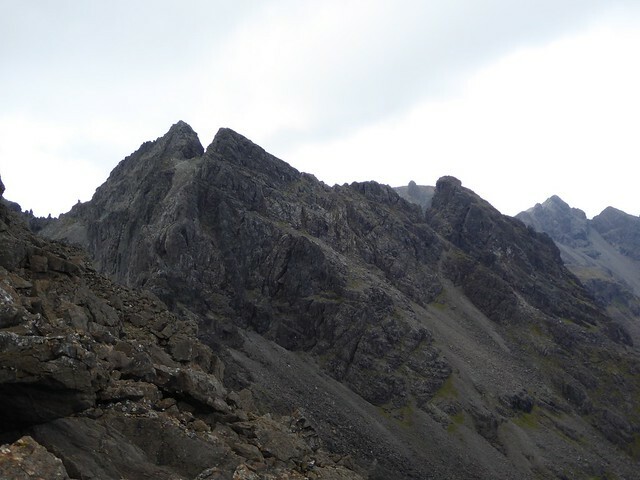 Apart from Bruith na Frithe which I did on my own last October and is not particularly tricky, I'd not been on the Cuillin ridge on my own before. But I couldn't find folk to come with me so there was only one thing for it - I'd have to do this by myself. I packed my lovely helmet and harness (although I have no other climbing gear ) and set off from Falkirk, back to Skye after a 3-week absence. 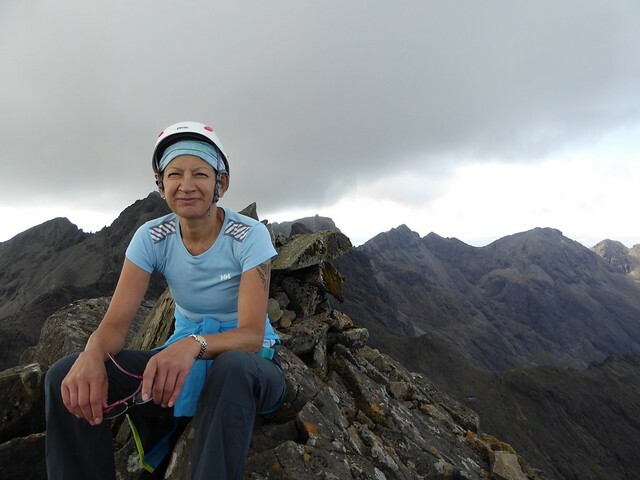 I stayed at the Glen Brittle Memorial Hut (lovely, great showers and well appointed kitchen, with a freezer to refreeze ice packs) and there met John and Trish who, as it happens, were doing Sgurr nan Eag and Sgurr Dubh Mor the next day. 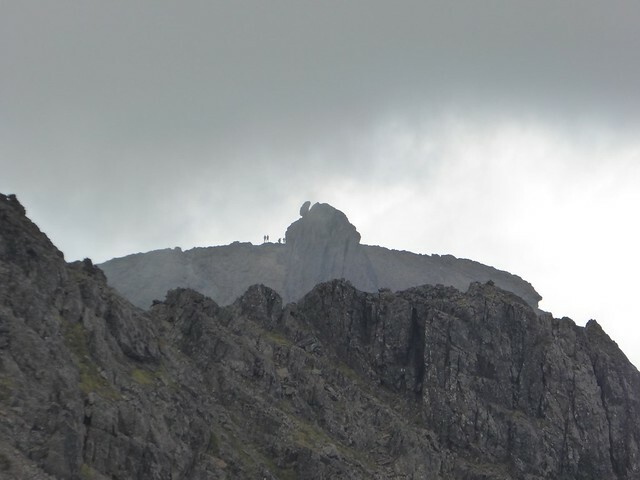 So we decided to join forces and set off at 9am in brilliant, warm sunshine, the ridge set beautifully against the blue sky and ribbons of cloud snagged on the pinnacles. We made a mistake by taking the right fork and thus missed the high path which goes into Coire Ghrunnda. We had to walk across grass to rejoin the Coire! 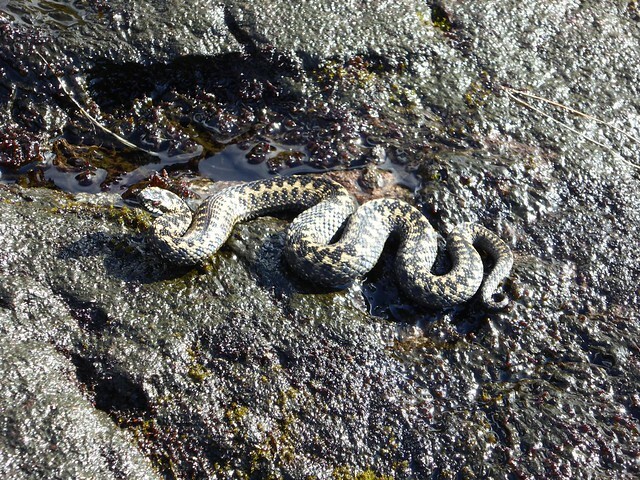 But our mistake was soon repaid by the sight of a beautiful adder coiled on a slab of wet Gabro warmed by the sun. We soon made up the time we had lost and met up with various groups of people who had come the right way just before the waterfall and first cliffs which bar entry into the upper reaches of the coire. A little bit of scrambling and route finding were required to get the brain and legs warmed up for what is to come! 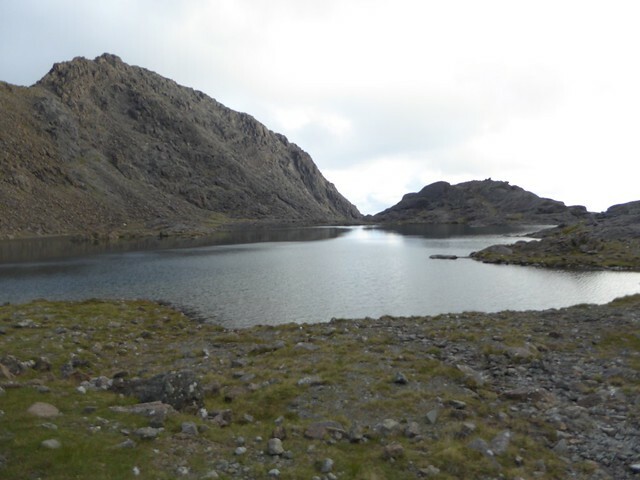 The water of the Loch a'Coire Ghrunnda is brown with muddy run off from the ridge and in places dark green, almost glacial, not the blue azure that Trish was hoping for! 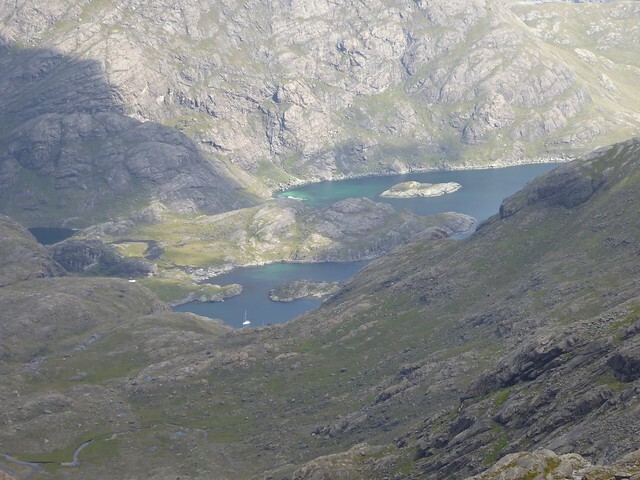 We contoured the lochan and headed south where we picked up the scree path that leads up to Sgurr nan Eag. This is really quite straightforward. We reached the ridge at a bivvy point and left our sacks to lighten our load to head to the summit. More straight forward route finding and easy scrambling before we reached the rather large summit cairn. By then the cloud that had shrouded this part of the ridge had cleared and we were treated to fantastic views to everywhere! 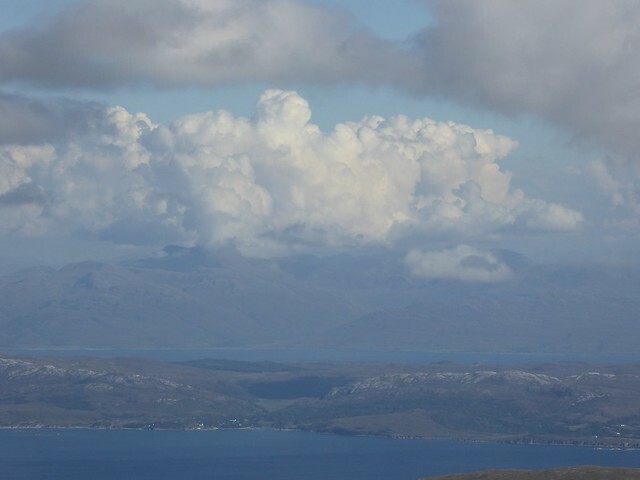 especially all the isles dotted about the Minch. 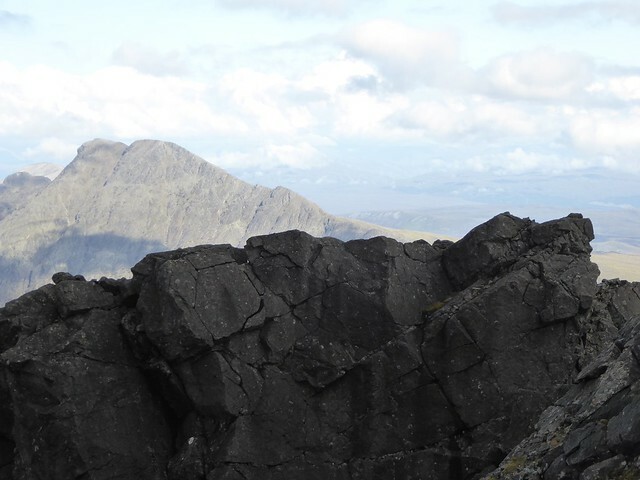 The Harris hills and the Rum Cuillin were stupendous. There was a sailing boat anchored in loch Scavaig, just where the water has turned turquoise, idyllic. The sailor and a friend duly appeared on the summit! They were heading back down and sailing the boat round to the safety of Dunvegan I think as the weather was forecast to deteriorate the next day with strengthening winds in particular. ho hum. 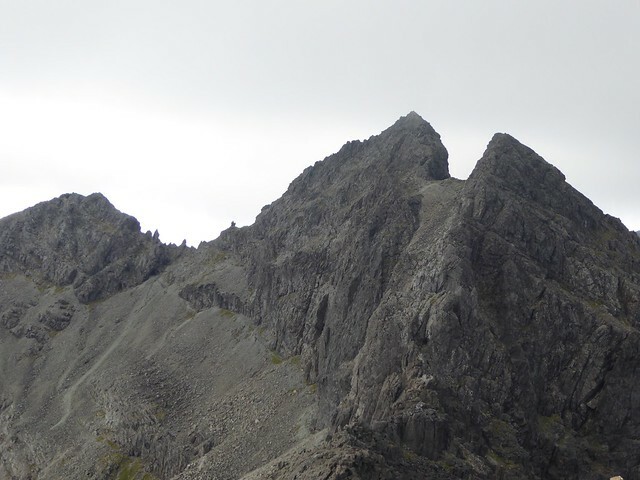 We left the summit, picked up our sacks and headed round the based of Caisteal a Garbh Coire and then on to the ascent of Sgurr Dubh na Da Bheinn which gives access to Sgurr Dubh Mor (there is another route, which avoids the ascent and stays just below the crest btw SGB and SDM but it didn't look inviting at all). The scramble up to SDB is fairly straightforward (Grade 1 mostly) but its summit is narrow and quite airy. 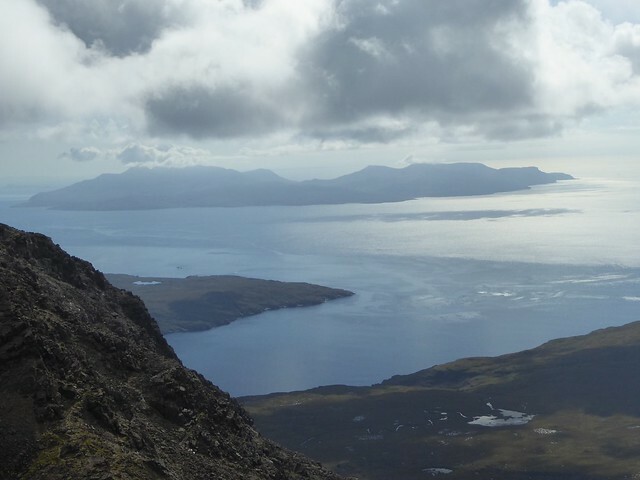 We continued on down to the bealach (where I left my rucksack) avoiding the pinnacles but staying high nonetheless. However route finding up to the narrow summit of SGM can be tricky at times. 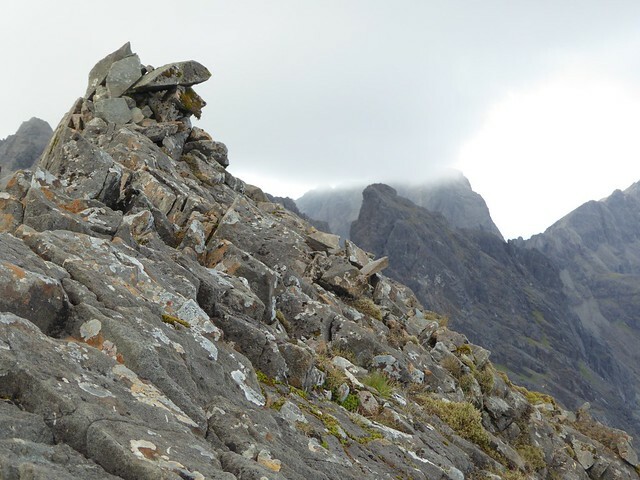 So at each crux point, we left mini cairns to find our way back on the descent! 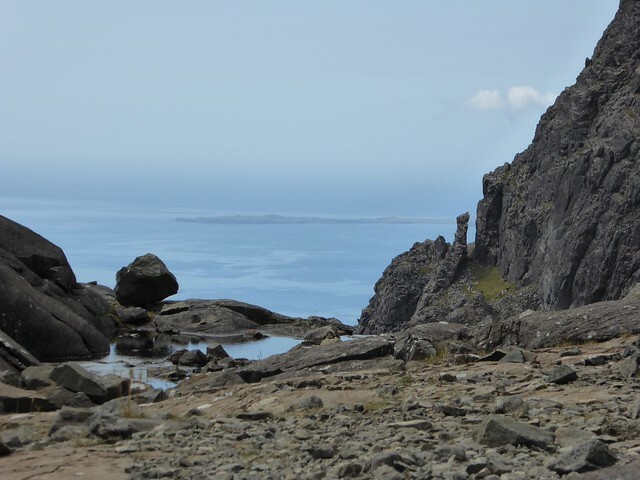 We worked out - after a few futile attempts at scrambling to dead ends - that the best way was to follow the bits of path we encountered to their end and scramble from there to the next mini path. This worked out well and we soon reached the summit, the cairn just a few stones to match the narrow crest. John wasn't keen to linger but the views to the rest of the ridge were spectacular. I saw a lone figure negotiating apparently easily the last stretch of the scramble to Sgurr Mhic Choinnich, which interested me because that's where I was headed the following day! 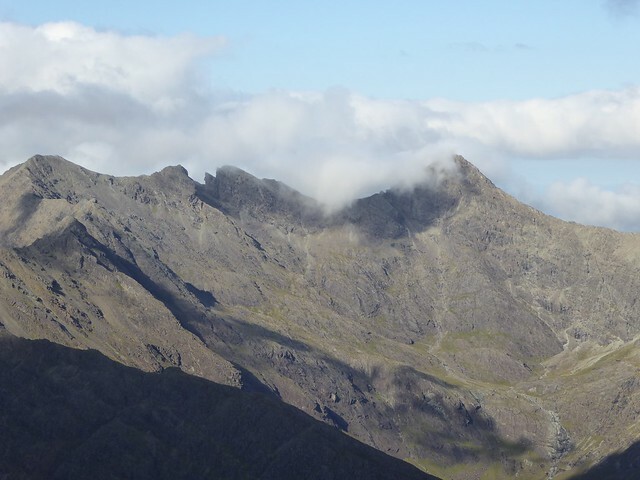 Great views of Sgurr Sgumain, Sgurr Alasdair with the pinnacles in between, the In Pinn, and the northern end of the ridge, Bla Bheinn, Loch Coruisk, everything. It was warm too, by then we were walking in short sleeves! We retraced our steps easily and only a couple of times did we have to downclimb facing the rock. 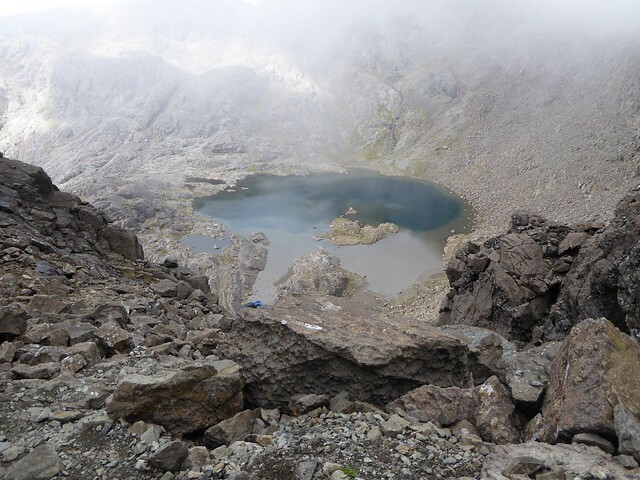 However we struggled to find the start of the way back down into Coire Ghrunnda and some negotiation ensued. John said his route description was to go right. So Trish went left Caught between those two, I suggested going down the middle so we scattered and each found their way down to the lochan. I think in hindsight that John was right to stay on the ridge and head further north before picking his way down a reasonably good stone chute. My way required a bit of scrambling down but I enjoyed it and we all landed on the corrie floor safely roundabout the same place. It took a good 90 minutes to get out of the corrie and back to the campsite. By then I was roughly 20 minutes ahead of J&T so I just left them to it and I almost ran on the fantastic path to the campsite, electing to walk the last kilometre straight to the Hut rather than wait for J&T to give me a lift back. We were all back at the Hut around 8pm. An excellent, albeit long, day with cracking views, Grade 1 scrambling mostly and excellent company. 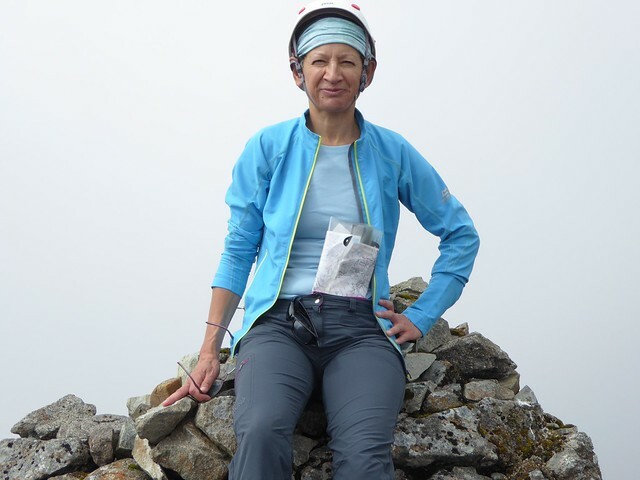 Great report and photographs Emmanuelle. We were on Skye on the following Thursday in Abysmal weather. BTW I think I met you coming down of Ben Challum last December? Guinessman wrote: Great report and photographs Emmanuelle. Splendid views. A great day out.